There are two new bathrooms in this Auckland Villa, one bathroom is traditional, the other modern. But both are beautiful, functional and fantastic! An extensive renovation in a classic Kingsland villa included the additional of an ensuite off the new master bedroom. In this very petite space – only 1200x2400mm – we fit all the essentials: a roomy walk in shower, and wall hung sink and toilet. For storage there is a very large recessed mirror cabinet running almost the full width of the wall outside the shower. With space at a premium, a modern aesthetic was called for, black and white to keep it simple and clean, minimalist fixtures. In the main bathroom, with more space to work with, we went for the more traditional style called for by the architecture, and preferred by the owners. 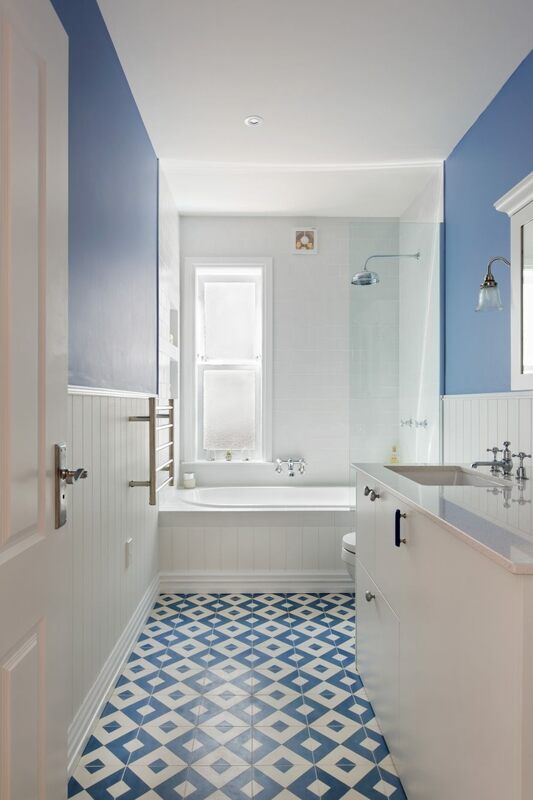 Here a rain shower head sits over a roomy tub, timber panelling and subway tiles line the walls and bright blue paint echos the colour of the geometric cement tiles. A large vanity provides storage and space for a combination washer/dryer unit while the furniture style mirror cabinet with traditional scotia and old style glass wall lights complete the look of this beautiful and inviting bathroom.